Home » [Cakewalk Products] » SONAR » How do I enable MIDI keyboard input? AnsweredHow do I enable MIDI keyboard input? How do I enable MIDI keyboard input? I have on several instances recorded through a soft synth from an Oxygen midi keyboard. But I mostly use guitar and bass, so I never learn the mandatory steps to take. Today I needed a soft synth from kontakt, and it simply does not receive input from the keyboard. This happens so often that I hesitate to even think about a piano or other midi things in my projects. Virtual keyboard works. I've allways had to fumble around until suddenly, it receives my input with sound. Try setting it to All Inputs, MIDI Omni as shown above first. You can be more specific, and tie it down to a single controller and/or MIDI channel if needed. Other times/synths, this input is set to none by default, and it still works. Seems very random, very hit'n miss and confusing. 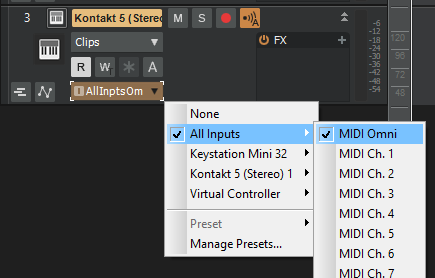 Set your MIDI channel input to Kontakt. If at any time you lose control between Kontakt and your MIDI controller simply ckick on the MIDI track Kontakt is assigned to, or click on Kontakt in the Synth Rack in the browser. Custom built workstation. Windows 10 Pro x64. SONAR Platinum. Cakewalk by Bandlab. ASRock 990FX mobo, AMD FX 8370 8-Core. 16 gb DDR3 PC1866 G Skill Ripjaws X RAM. AMD FirePro V4900 1gb DDR5 accelerated graphics card. Decided to try this again now. So I inserted same kontakt synth, and tested without any change of settings. -Input set to none by default. And there was sound. There was registered input. Hit today. Miss tomorrow, maybe. But why then, did it just work yesterday, without doing anything other than inserting the synth? I changed no settings in any column. Nor did I set anything in Kontakt. Input on the strip was set to "None"
I've had weird MIDI stuff happen that turned out to be a bad MIDI cable. You're probably not using a MIDI cable, but how about trying a different USB cable? Try loading multiple instruments, each with different channels. It may be that loading only one inst. is like using the Dimension Pro synth, where you only have one inst per synth, so the channel doesn't matter. It works, but only for that one inst. Sorry if this is a trivial answer. Take notice that when you insert an instrument in an instance of Kontakt, it usually gets loaded to receive midi through channel 1. If you then decide to change it, and add the new one before deleting the first, the second gets automatically loaded by Kontakt to receive midi in channel 2. If your Cakewalk track was set up to send to channel 1, you will not hear your instrument until you change the channel in the header of the new instrument to 1, or set the Cakewalk track to channel 2. Nothing is trivial when it comes to midi. :) Thank you. 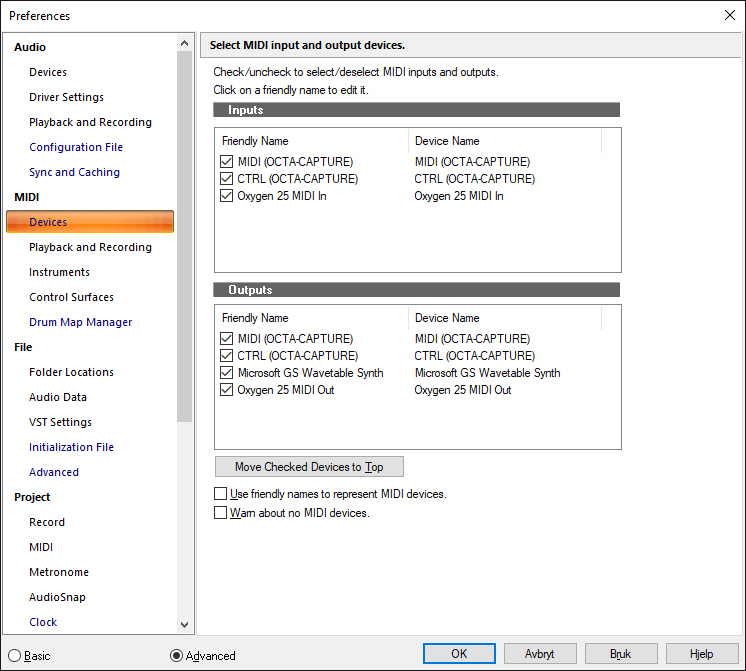 2) default Echo is "auto", means it is automatically switch on when the track is selected and off when deselected. Controlled by Preferences / MIDI /Playback and recording, "Always echo current MIDI track". Note then when the option is on, disabling/enabling on the track level is reset once you select different track. 3) in the Windows tray, there is MIDI icon which indicate in/out signals. Useful to check the hardware sending something. 4) if you get no sound and do not know at which part something wrong, simply try to record MIDI on the track. RME Babyface Pro (M-Audio Audiophile Firewire/410, VS-20), Kawai CN43, TD-11, Roland A500S, Akai MPK Mini, Keystation Pro, etc. If it doesn't I will find that PRV is open and focus is still on a different track. It should automatically swap to the new track but this doesn't always happen for me. Focusrite 6i61st - Tascam us1641. Did you turn on Input Echo on the midi track?